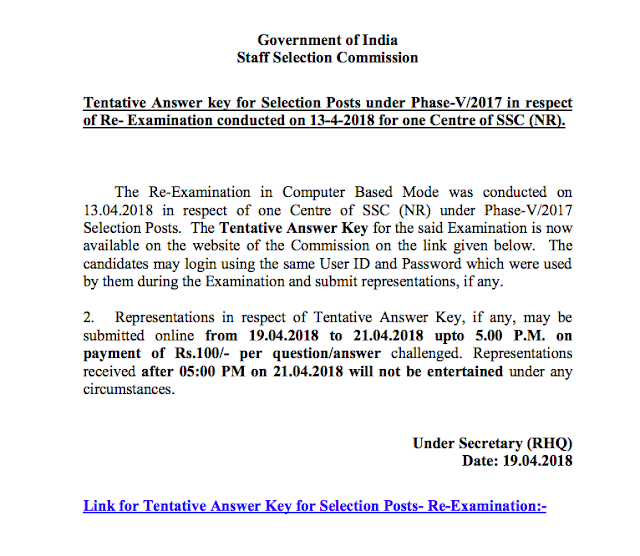 The Re-Examination in Computer Based Mode was conducted on 13.04.2018 in respect of one Centre of SSC (NR) under Phase-V/2017 Selection Posts. The Tentative Answer Key for the said Examination is now available on the website of the Commission on the link given below. The candidates may login using the same User ID and Password which were used by them during the Examination and submit representations, if any. 2. Representations in respect of Tentative Answer Key, if any, may be submitted online from 19.04.2018 to 21.04.2018 upto 5.00 P.M. on payment of Rs.100/- per question/answer challenged. Representations received after 05:00 PM on 21.04.2018 will not be entertained under any circumstances.